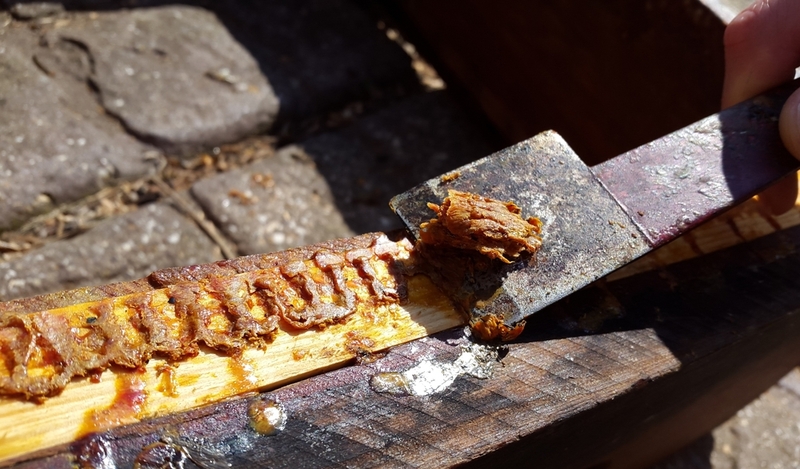 Propolis is the reddish brown sticky resin that bees stick things together with, bung up gaps with, and strengthen wax with. Apparently they collect it from trees. I have seen propolis foragers in the hive - on their rear legs where the pollen basket is they have a dollop of propolis like a bead of glue. One of the wonderful things about propolis is its scent. It is ylang ylang, vanilla, a pine forest on a hot day, and a glass of mulled wine. And it emits a toasted version of these scents when burnt with a blowtorch, which enlivens the task of sterilising a second hand hive or flame-cleaning a queen excluder. 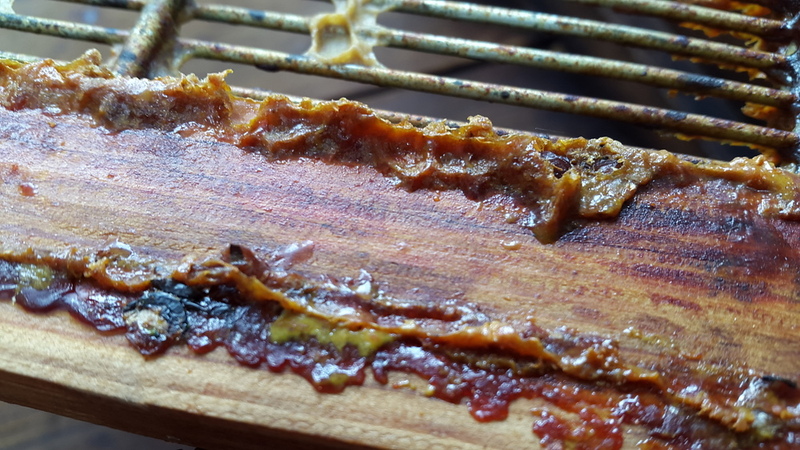 Propolis is said to have antiseptic qualities. So when cleaning the Smith Hive in preparation for storage, I decided to "harvest" the propolis off it and make a tincture. Except, I didn't get round to it for a couple of weeks. The propolis scratchings stayed in their jug at the back of the fridge, covered in cling film. Today I went back to it. In the history of science, this is how serendipitous discoveries are made. What I discovered is: propolis doesn't smell so good after it's been in the fridge for a couple of weeks. The heady and complex scent that I raved about above had changed - vanilla was still there, perhaps more so, but now it had taken on a sickly creaminess. My nose was disappointed. Anyway, this meant there was less to lose by experimenting with tinctures. I poured vodka (40 % abv) into the jug. Not much happened. The propolis didn't dissolve. A few bits of dried grass and beeswax separated out and floated to the top. The propolis stayed at the bottom. The vodka turned slightly yellow. A cautious sip...the taste is initially earthy, and there's the ylang ylang, then an after-taste reminiscent of plasticine. Not as bad as I feared. I shall leave it to develop in the jug for another couple of weeks and we'll see what happens.